Get to know a little bit about our facility and the people that make us unique. Enjoy the following Tour Through Red’s. 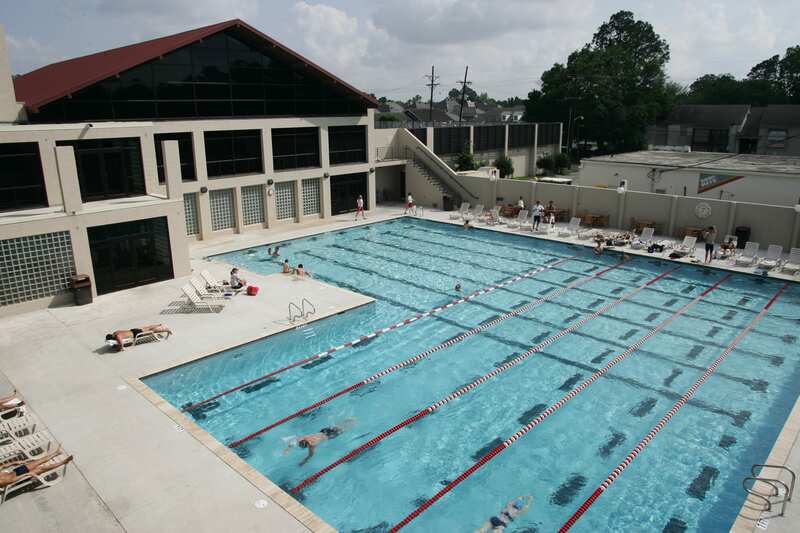 Red Lerille’s Health and Racquet Club, established in 1963, is the South’s largest and most complete health club. Red’s covers 20 acres and includes 195,000 sq. 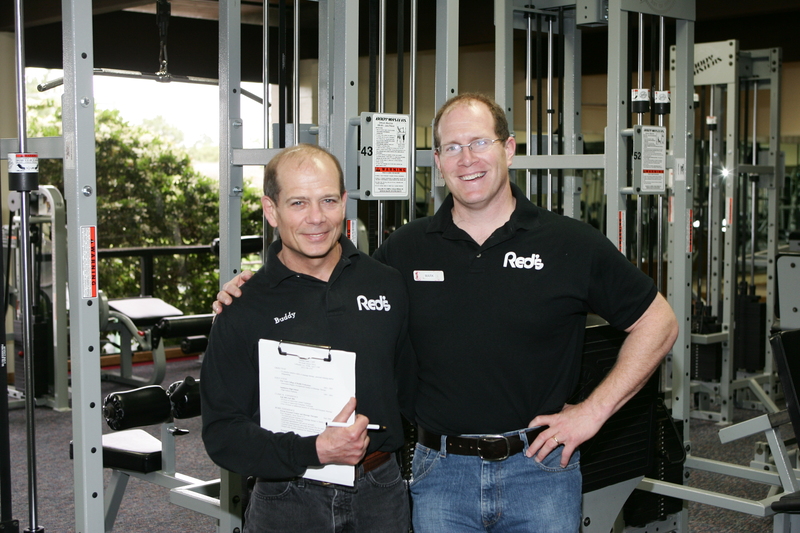 ft.
Mark Lerille and Buddy LeBas, our Fitness Center managers, along with their qualified instructors and personal trainers provide custom fitness programs for all members over 9 years of age. 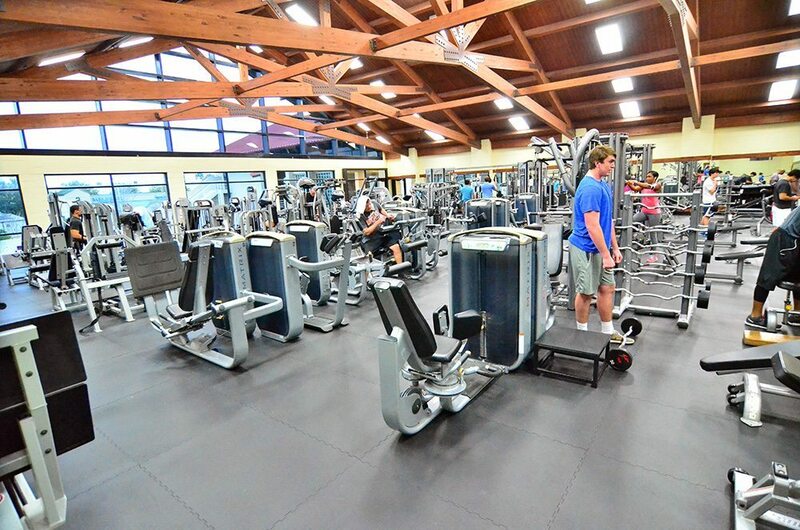 Our largest co-ed fitness area is located downstairs and is equipped with a large number of free weights, as well as, plate loaded equipment. 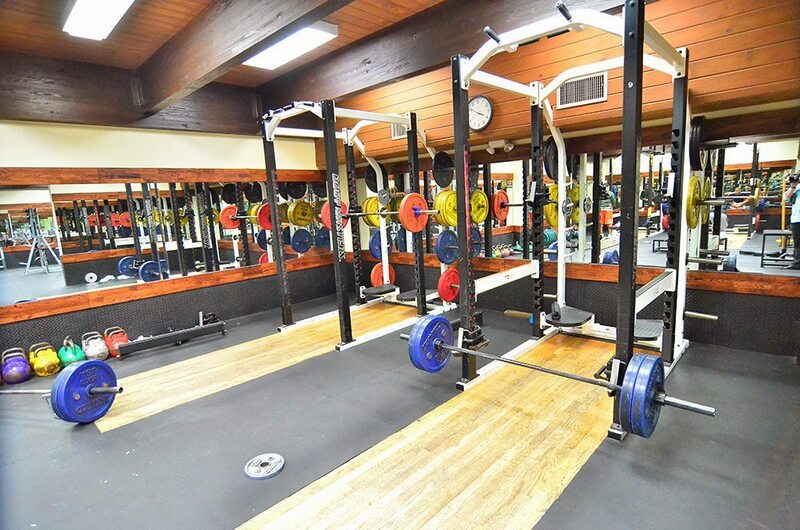 We also have a fully equipped power-lifting room. This area is available to men and women 14 years and older. 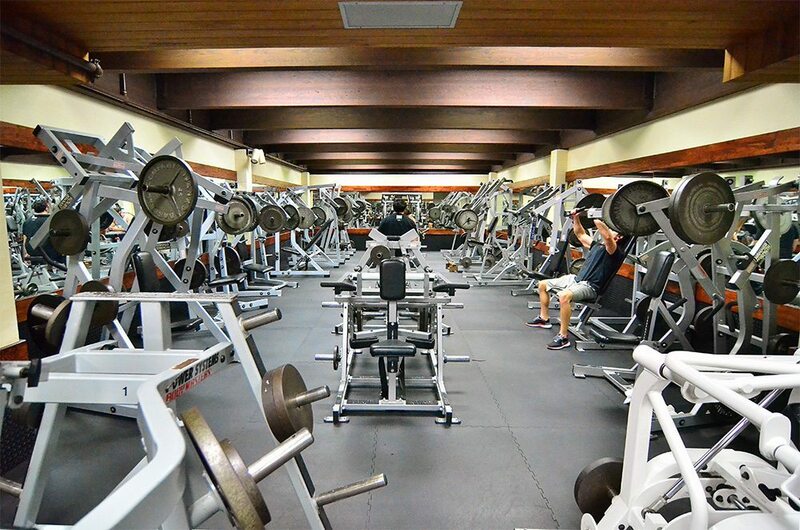 We have a Ladies Only fitness area for those looking for a little extra privacy. 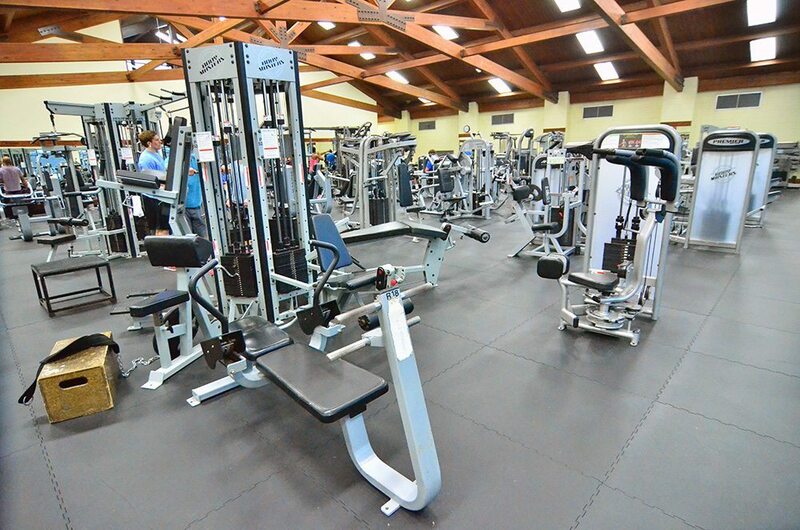 This area also includes it’s own cardio equipment and is available to members 14 years and older. 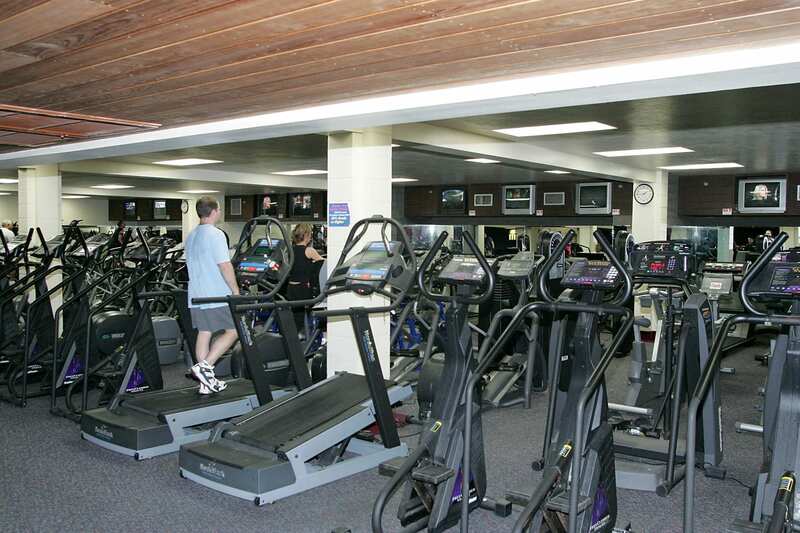 Our 2nd co-ed workout area is located upstairs and is a little smaller and quieter than the downstairs area. 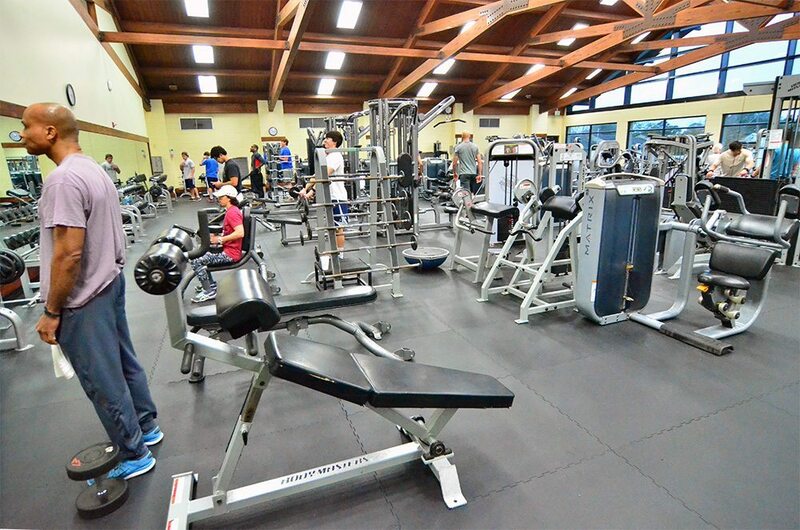 This area has less free weights and more selectorized equipment and is available to men and women 14 years and older. 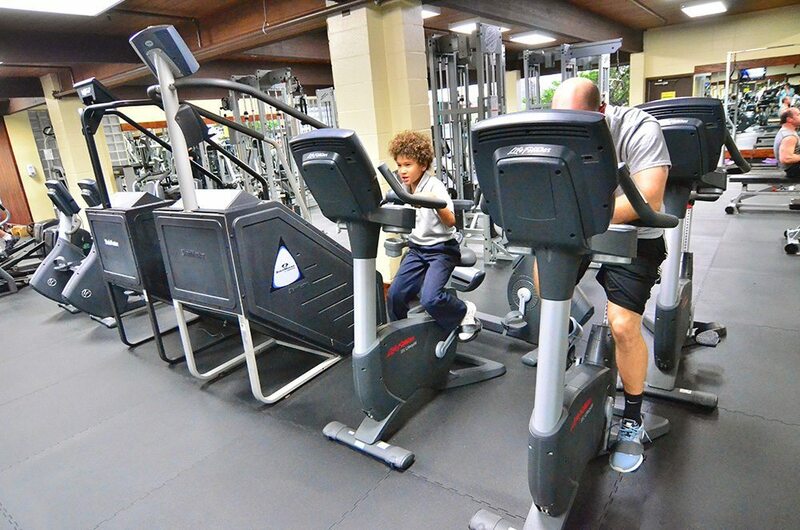 Our “Family” workout area is located upstairs near the cardio area. 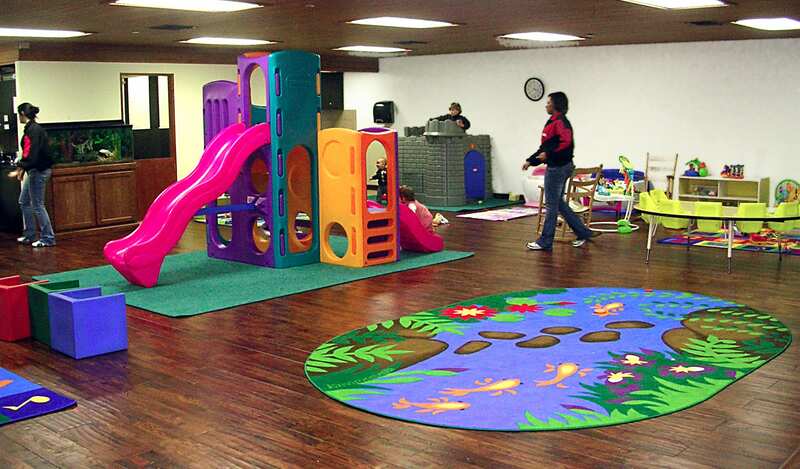 The equipment is suitable for kids 9 – 14 years of age, but also appropriate for adults. 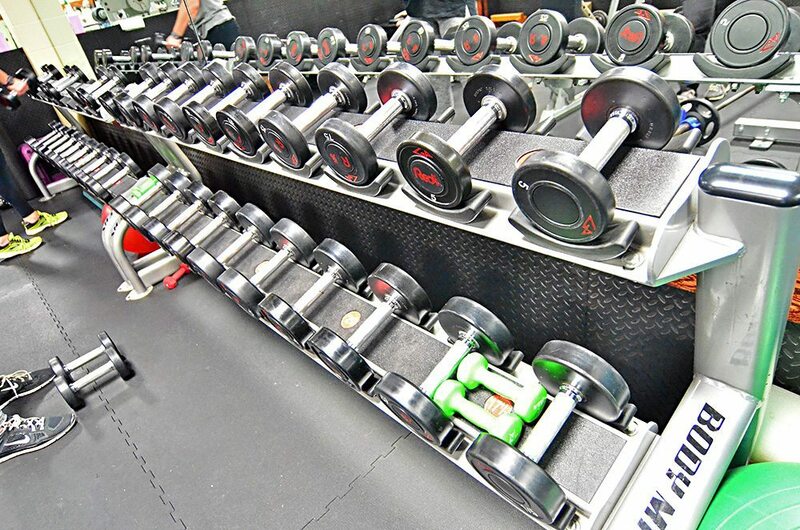 It includes mostly selectorized equipment, as well as, cardio equipment. 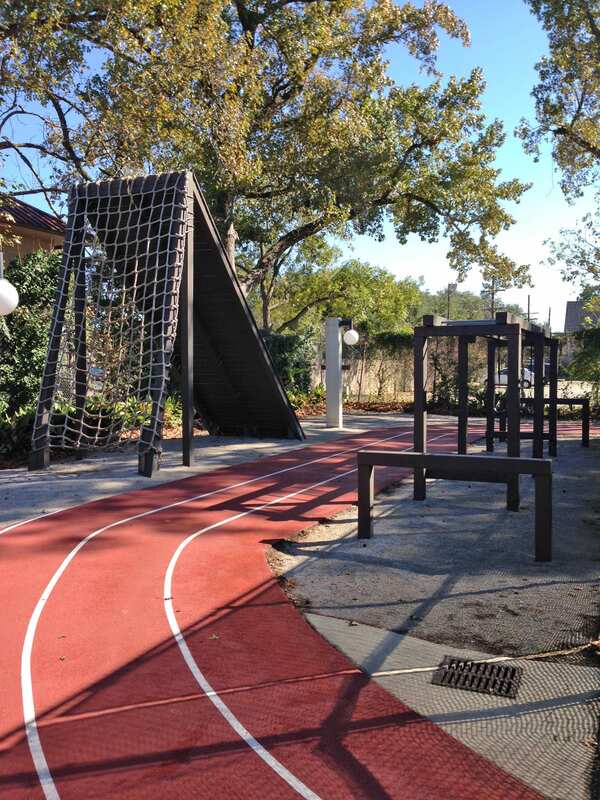 Parents are welcome to workout with their kids in this area. 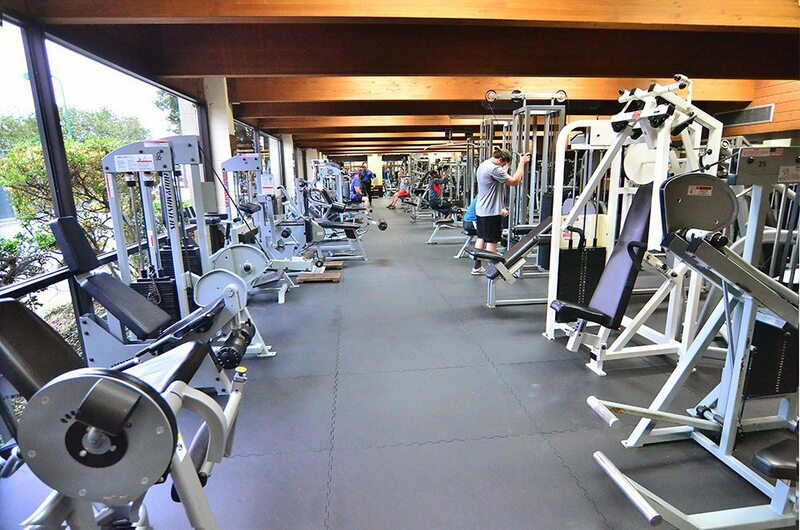 Our 10,000 square foot M.I.T. 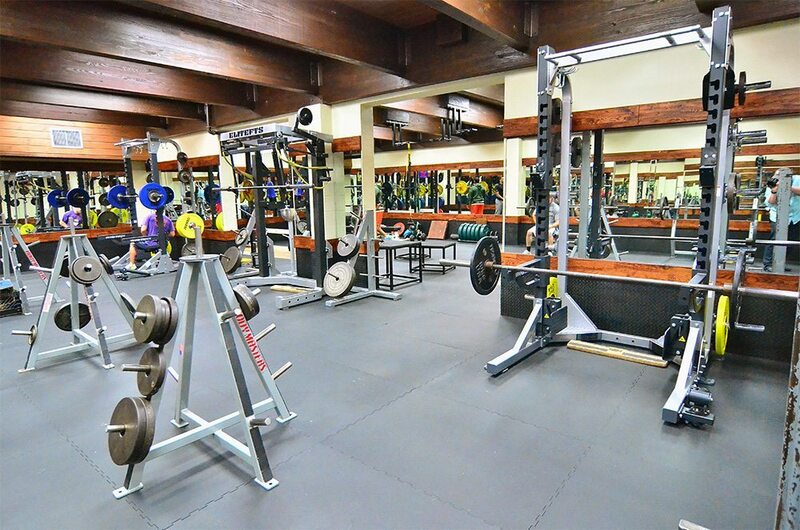 (Maximum Intensity Training) facility accommodates a variety of personal training types and classes including: Just Wanna Be Fit, Boot Camp, XFit for Adults, Kettlebell Training, Hour of Power (bike trainer class), Athletic Conditioning for Young Adults, Fit to Run and Team Training. 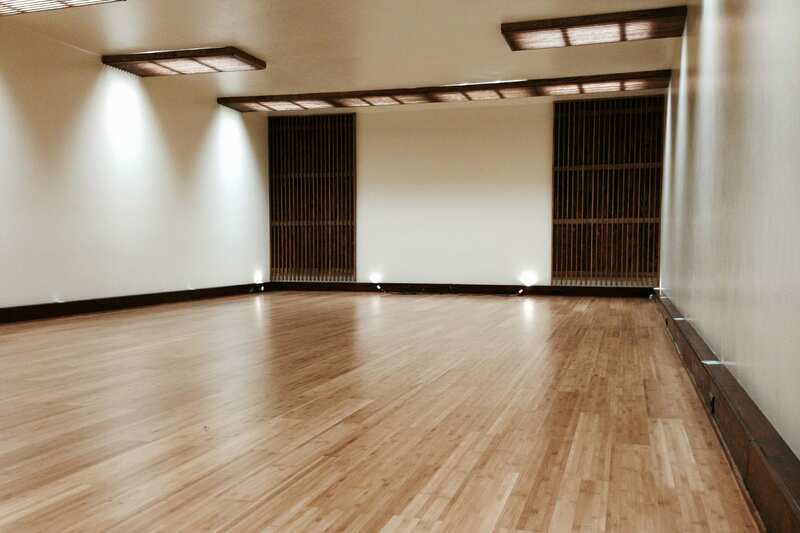 We hold our larger classes here in Studio A such as: Step, Pump, Zumba, etc. 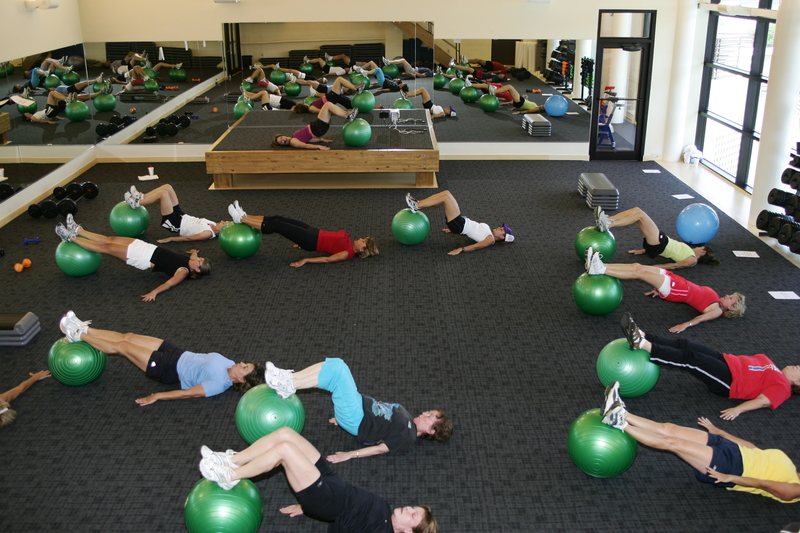 We hold our smaller classes in this room such as: Fitness 101, Pilates Mat, Abs & Stretch, etc. Our Cycling classes are appropriate for beginners to triathletes. 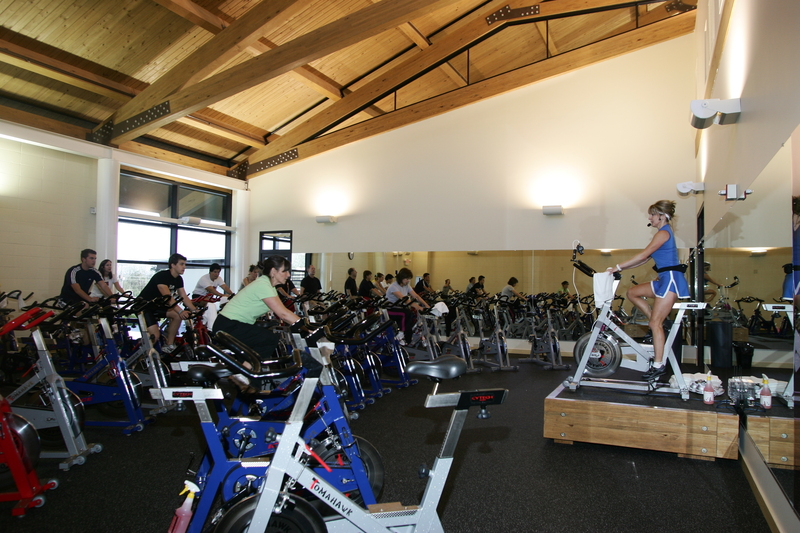 See an instructor before class to help you adjust the bike settings to fit you. 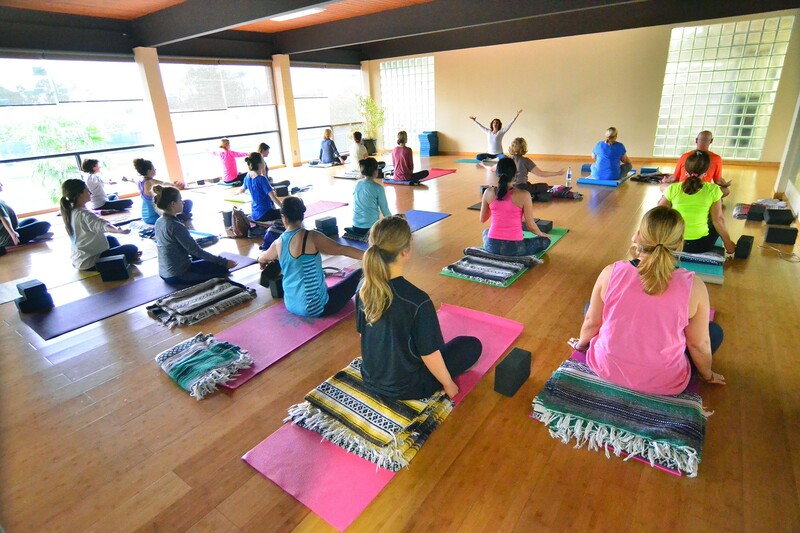 We have 2 Yoga rooms to accommodate our large number of classes and variety of class styles. 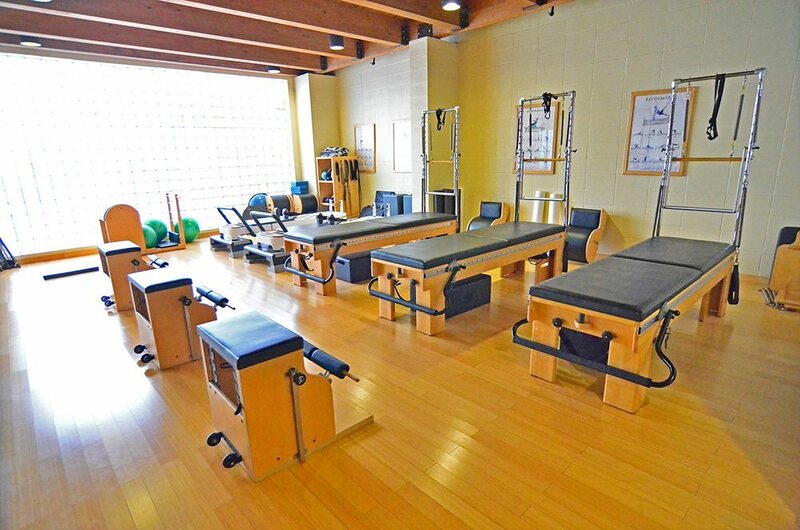 This fully equipped Pilates equipment room is available through our personal training program. This is a unique method of training with a weighted pulley system and is available through our personal training program. 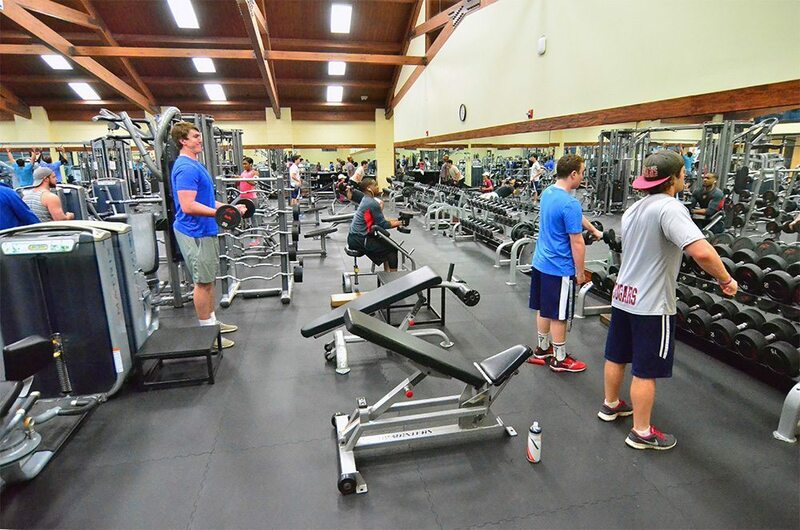 Classes are offered at no charge to members 14 years and older in the small indoor pool. Check HERE for the schedule. 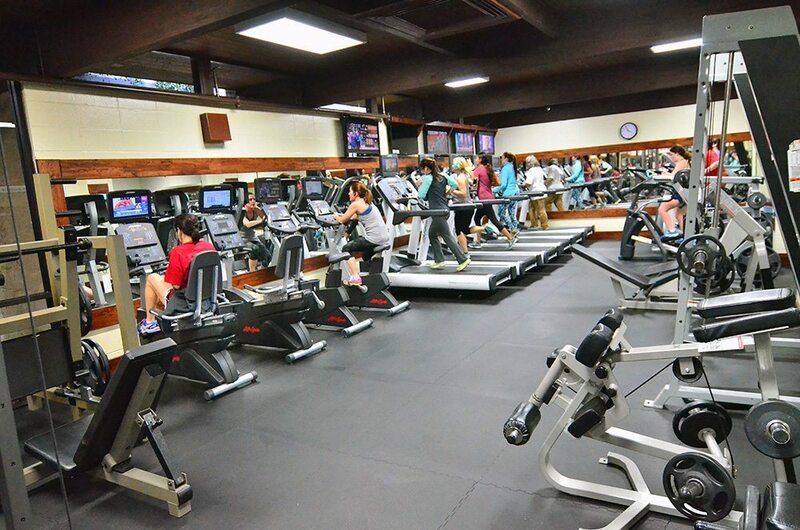 We have a large co-ed cardio area, as well as a ladies only area. 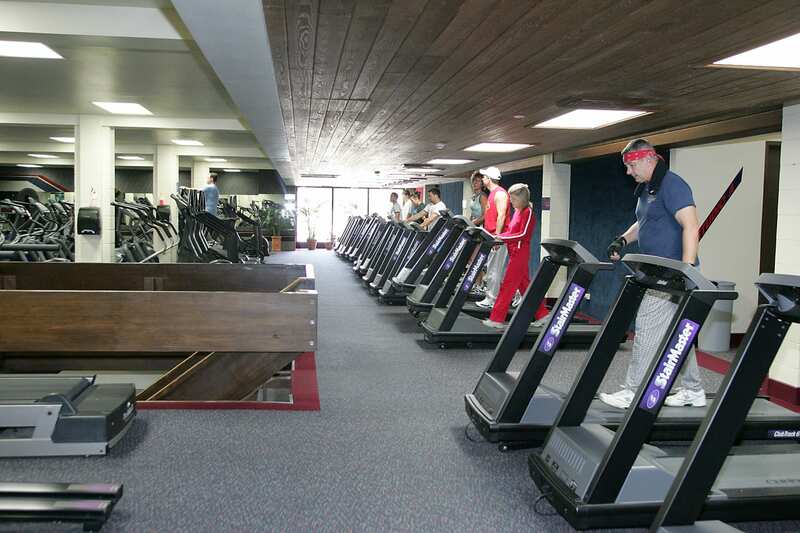 The cardio area has a huge variety of cardio equipment including: treadmills, step-mills, elliptical trainers, bikes, rowing machines, nordic tracks, etc. The area is equipped with free wi-fi so that you can tune in to your choice of music. We also have numerous TVs that can you can tune in to on an FM walkman. 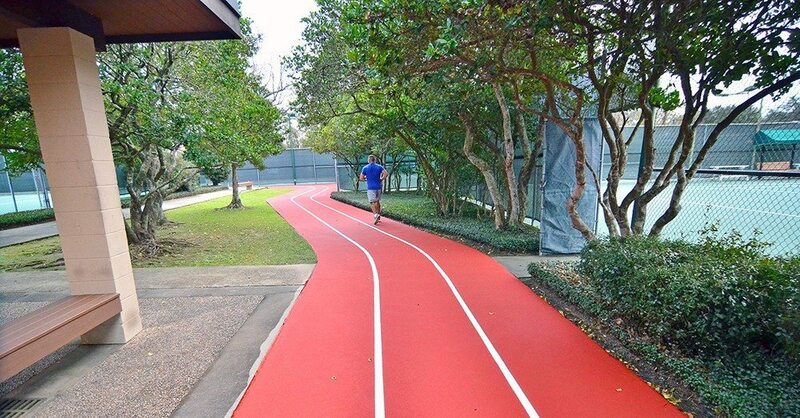 The indoor jogging track averages 14 laps to the mile. 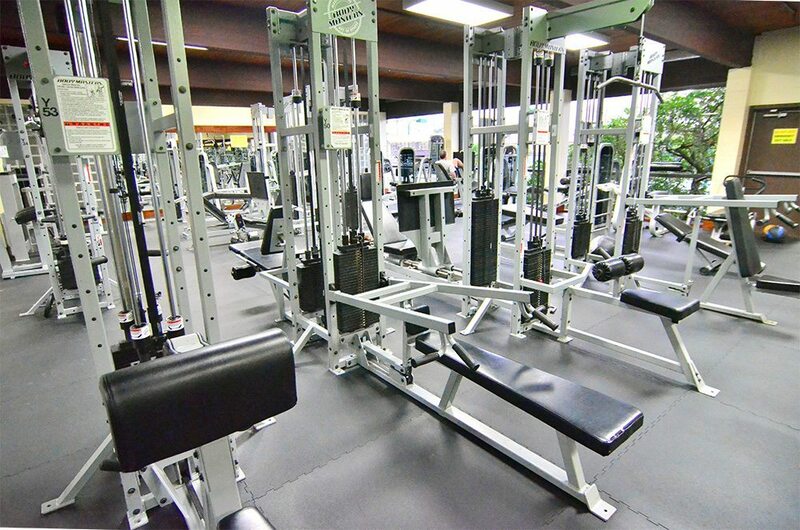 We also have fitness equipment located around the track to work out all major muscle groups. 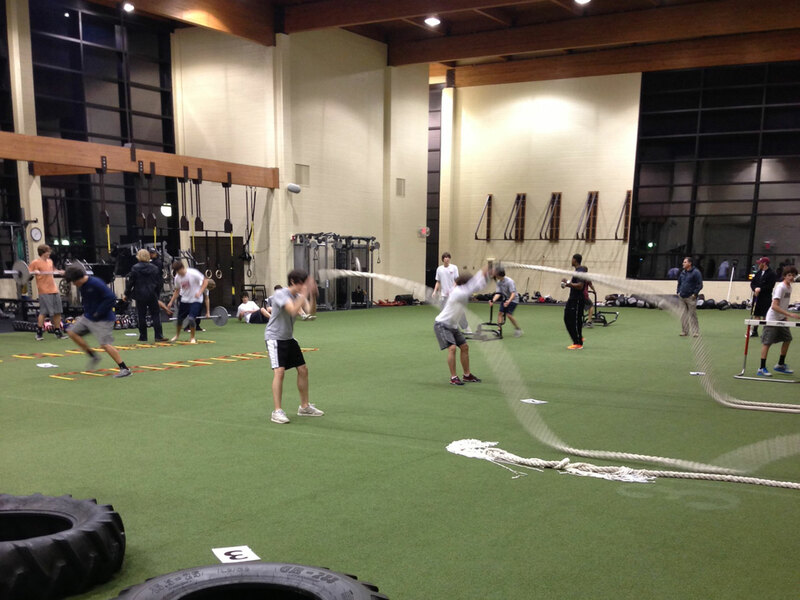 This environment provides excellent circuit training opportunities. 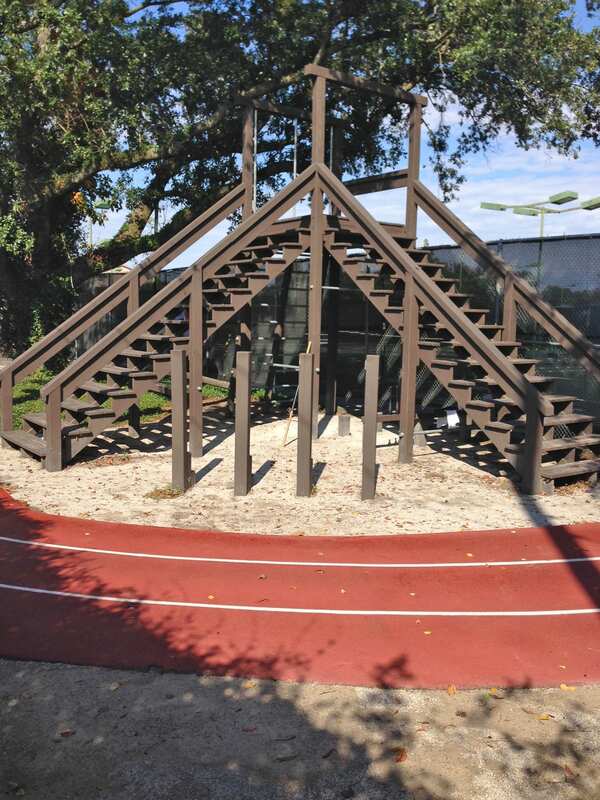 The outdoor track is 5 laps per mile. It has a cushioned rubber surface with banked curves. 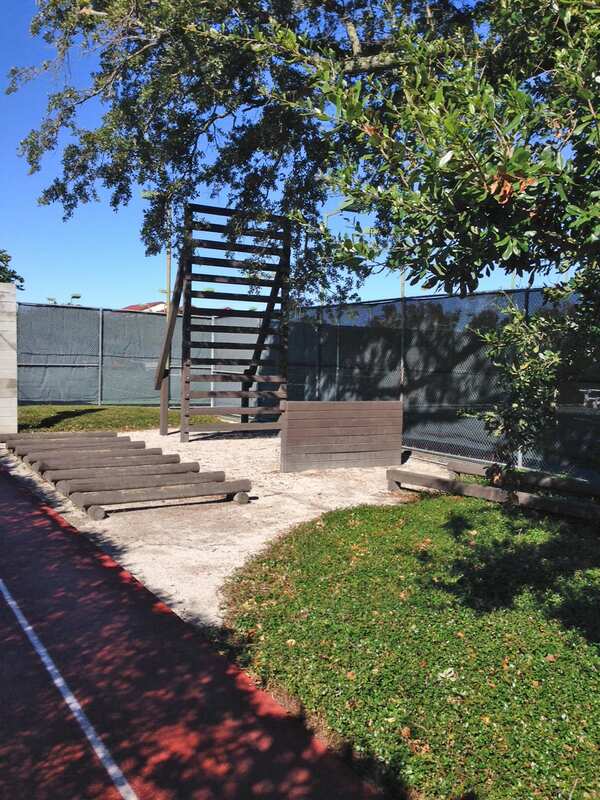 The outdoor Bootcamp Obstacle course is also in this area. 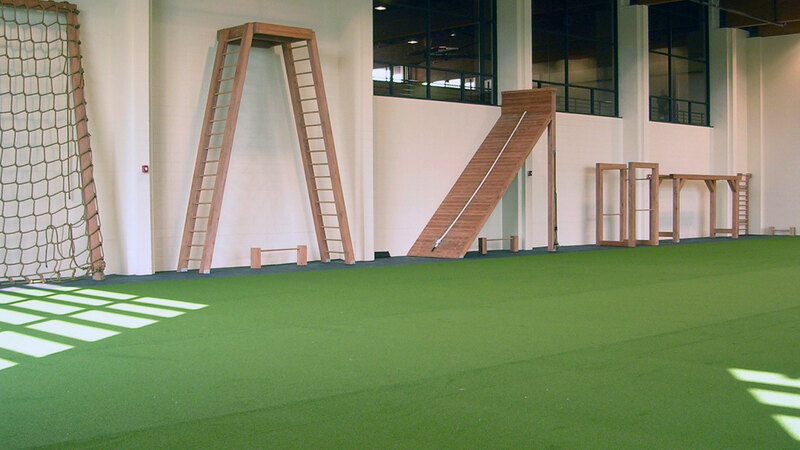 Our Indoor Bootcamp obstacle course is located in our M.I.T. 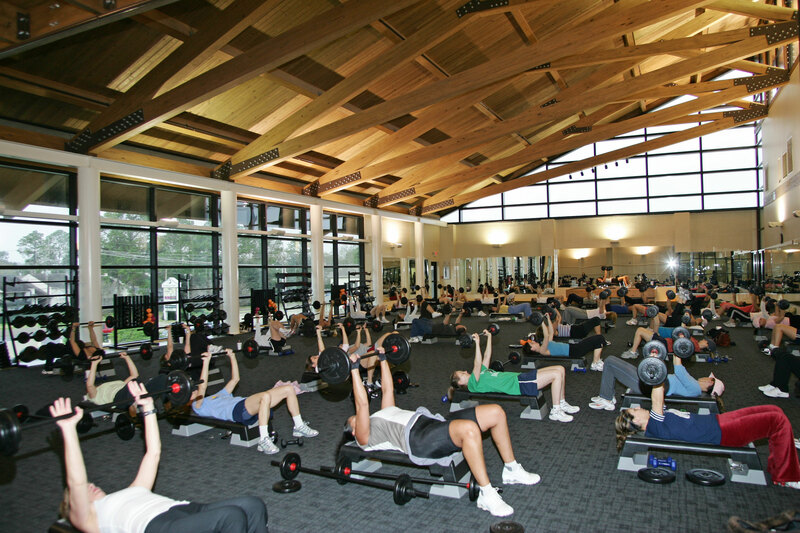 facility and is part of our group training program. To enroll in one of our monthly classes sign up at the Front Desk. 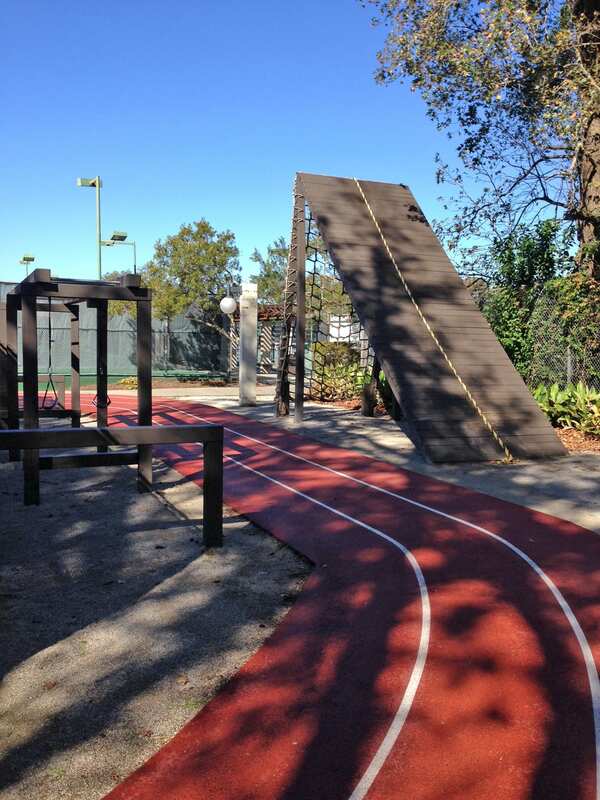 The outdoor Bootcamp Obstacle course is located throughout our outdoor running track and is available to all members over 14 years of age at no charge. 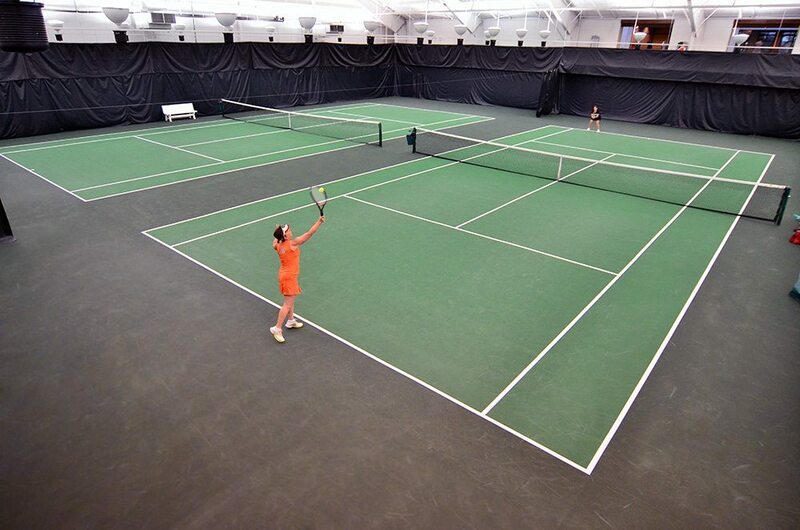 We have 3 indoor and 20 outdoor tennis courts. 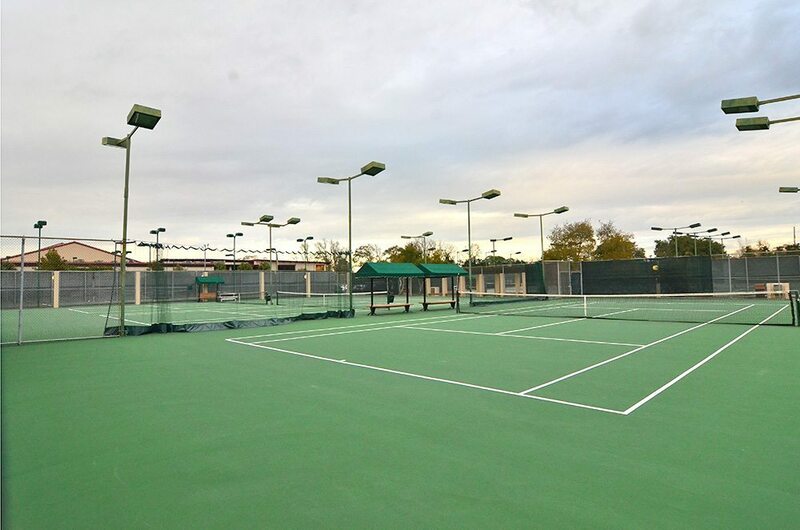 All of our outdoor courts are lighted including 6 rubico (soft surface) courts. 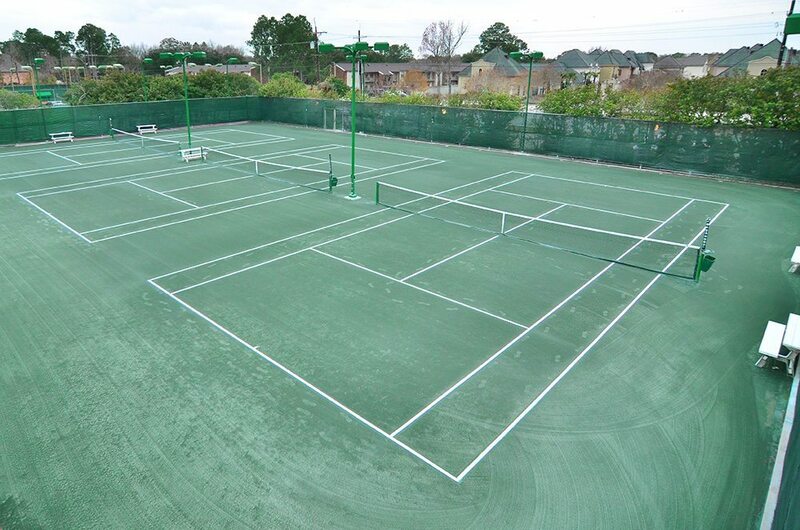 Our tennis professionals, Dianne Lowings-head pro and Pontus Laveflak are available for private or group lessons. 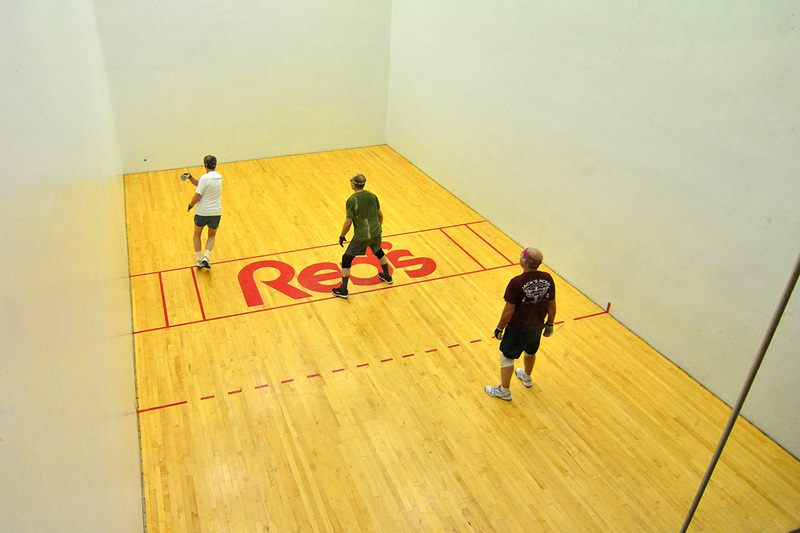 We have 4 racquetball courts, two of them have glass rear walls for viewing. 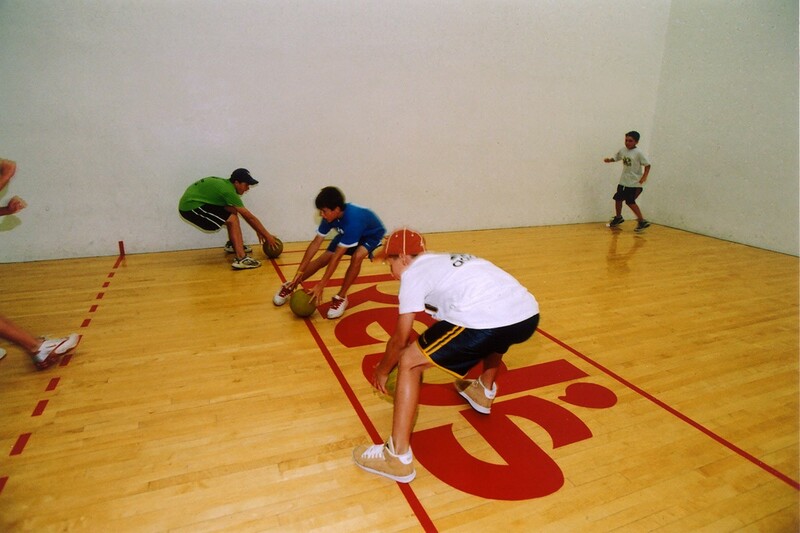 Dodgeball has been a huge hit for our youngsters during the summer. We even still have a few diehard handball players. 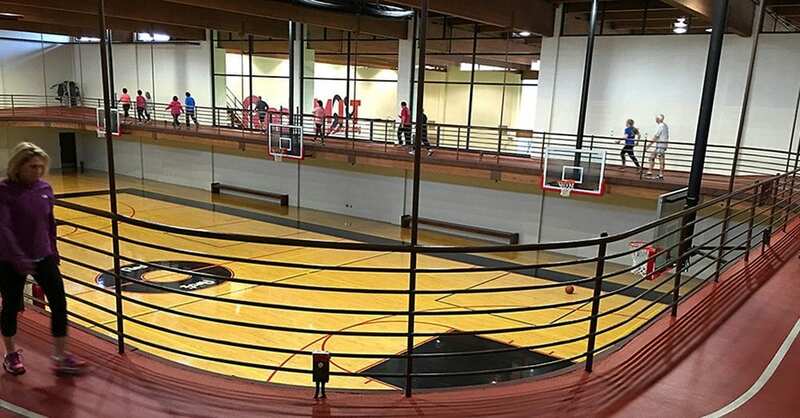 We have a full-size collegiate basketball court. 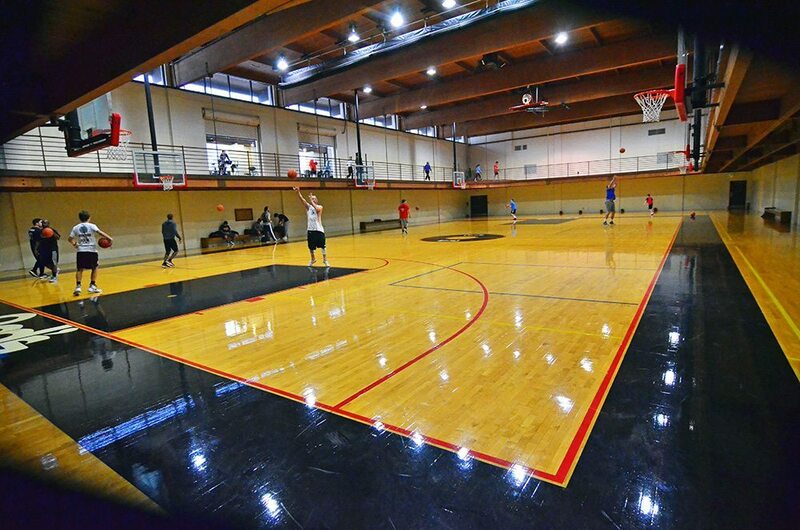 We play 3 “half” courts and occasionally play full court. Our boxing room includes a full-size regulation boxing ring. Chad Broussard, former world champion, and Mason Menard the current U.B.O. champion are available for personal training. 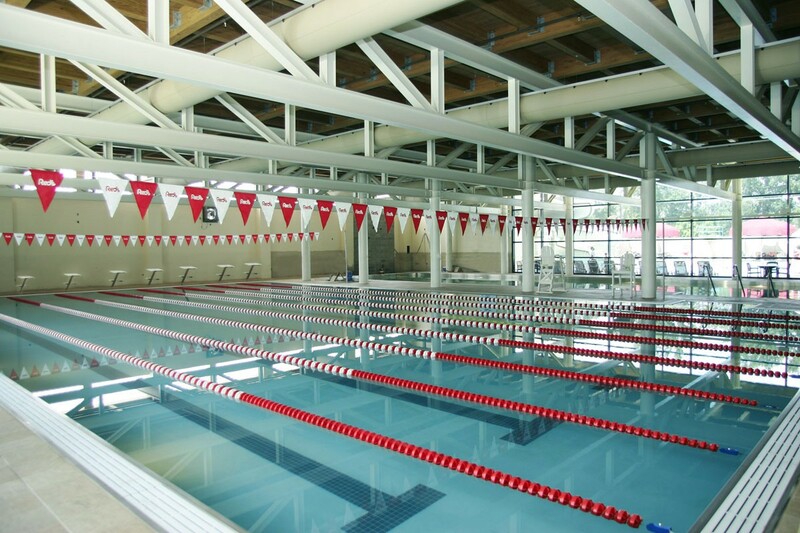 We currently have a junior olympic sized pool that is heated year round and available for lap swimming and aqua jogging. 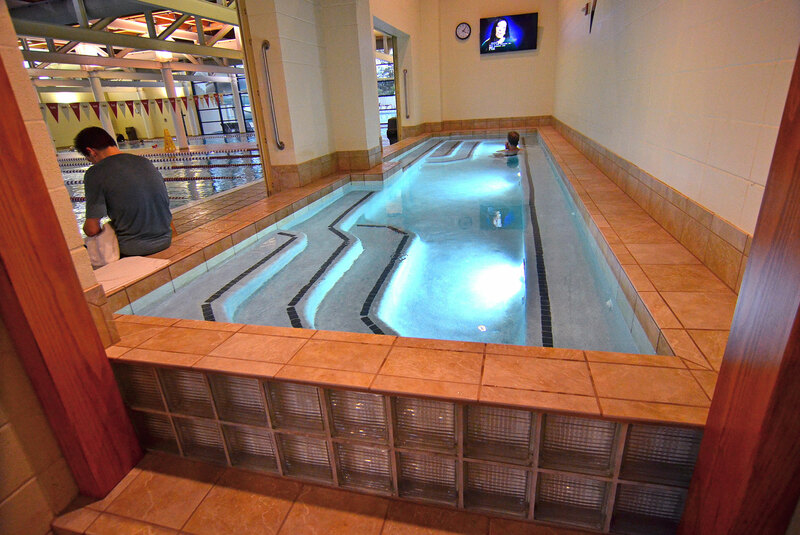 Our two indoor pools are great for swimming year round. 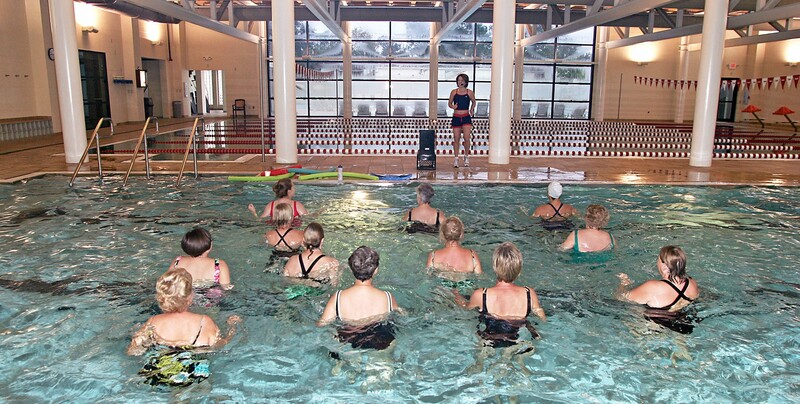 The lap pool is used for lap swimming and the other is heated slightly warmer and great for Group Aqua classes. The kids, of all ages, consider our family pool a “mini water park”. The zero entry is showered with a giant mushroom and numerous water fountains. The lazy river is a huge hit for kids and adults. The small slides keep our little ones entertained and the huge water slide is a “Ride” at any age. Our splash park is a big hit with our very small children. 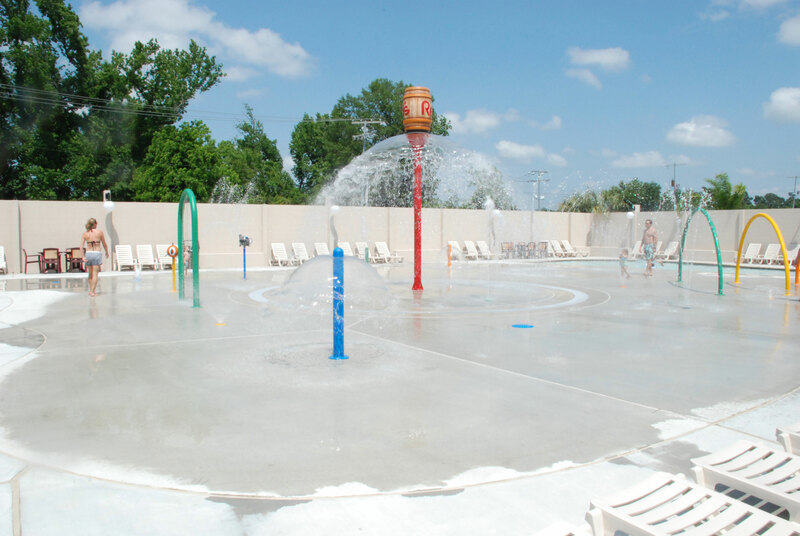 It is equipped with a number of water sprinklers and attraction, as well as a shallow wading pool just their size. 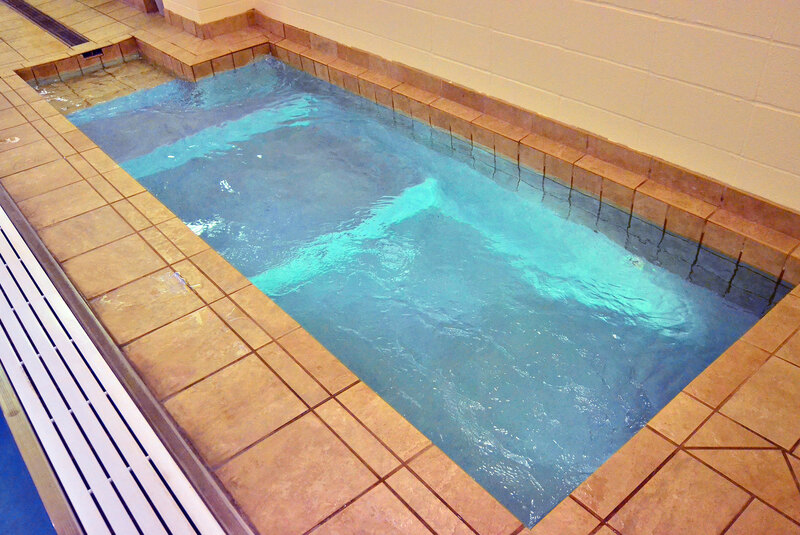 Our new enlarged cold plunge is heated to around 60 degrees and is sure to cure what ails you! 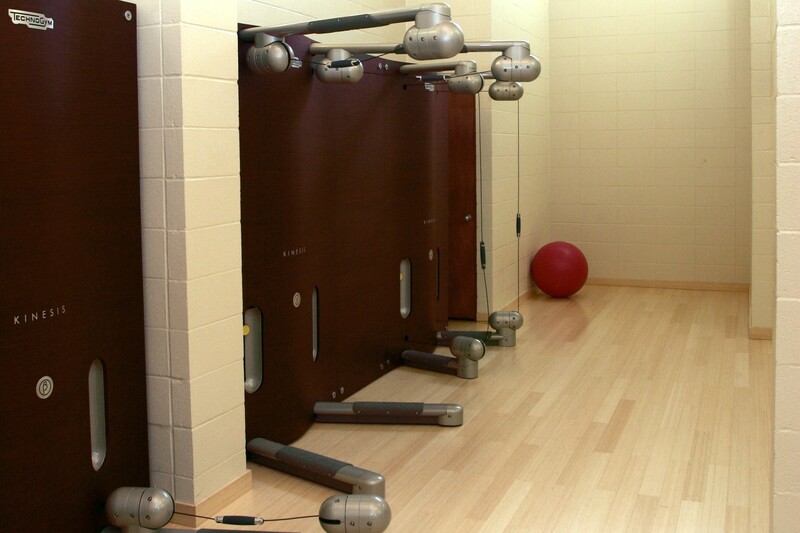 It is an extremely popular attraction to help relieve the post-workout soreness. We outgrew our old cold plunge, so we decided to convert it to a “Hot” plunge. The water is hot, similar to a whirlpool, but without the jets. 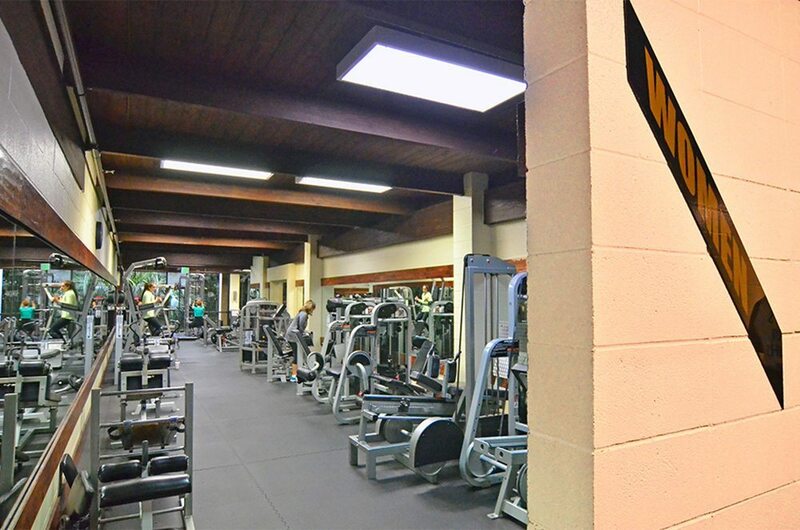 It is located inside the indoor pool facility and is co-ed. 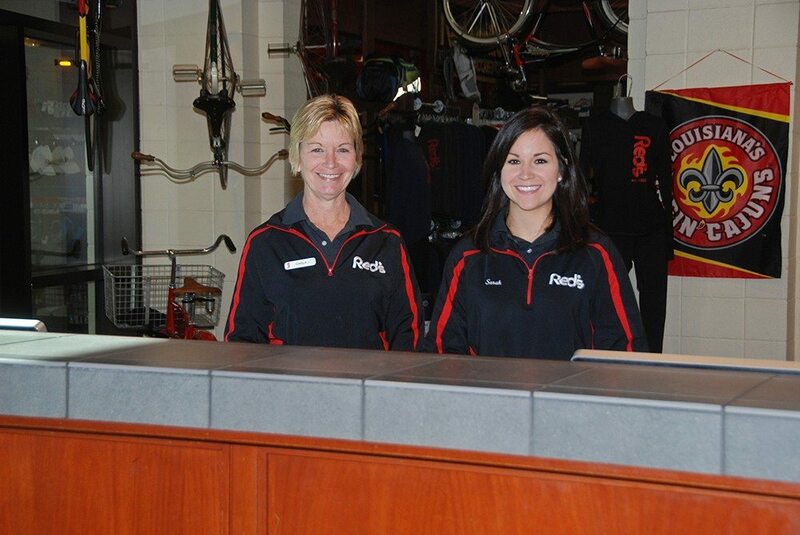 Carla, Sarah and their smiling Front Desk workers are here to answer all your questions. The Pro Shop is stocked with shoes, workout clothing and emergency items such as socks, batteries and razors. This is also where you reserve and check in for your tennis or racquetball court. 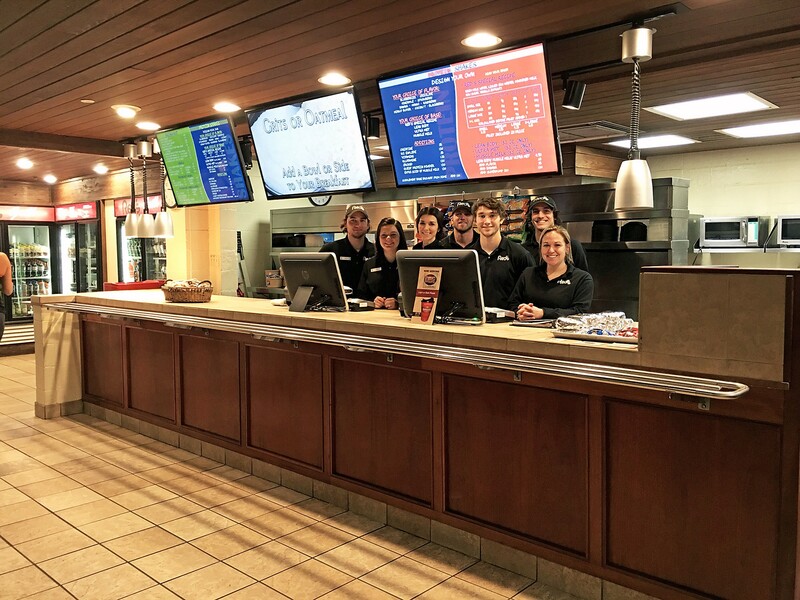 Amber, Jessica and their talented Snack Bar employees provide our members with healthy meals and snacks all day long. Starting with breakfast at 5:30am serving hot whole wheat biscuits, pancakes, eggs and lots more. 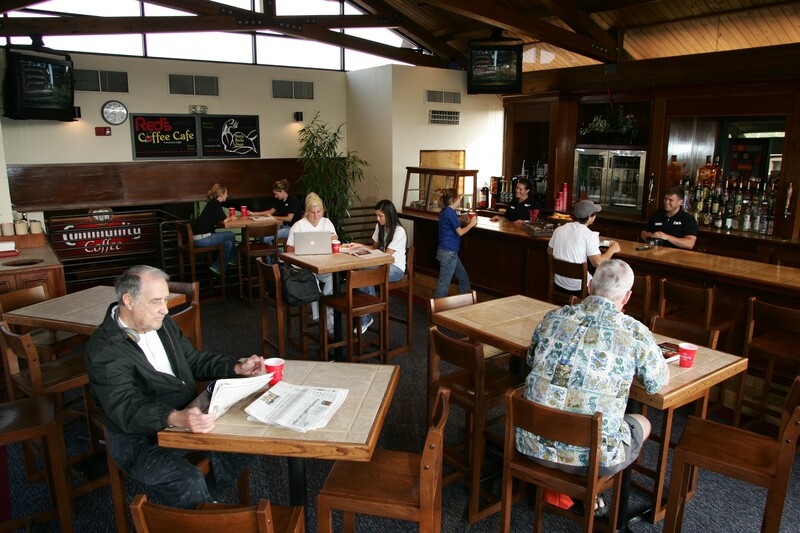 Throughout the day our members enjoy hot & cold sandwiches, salads, baked potatoes, and daily specials. Shawn and her well-trained nursery workers entertain and keep a close eye on your little members under the age of 9 years of age while their parents work out. 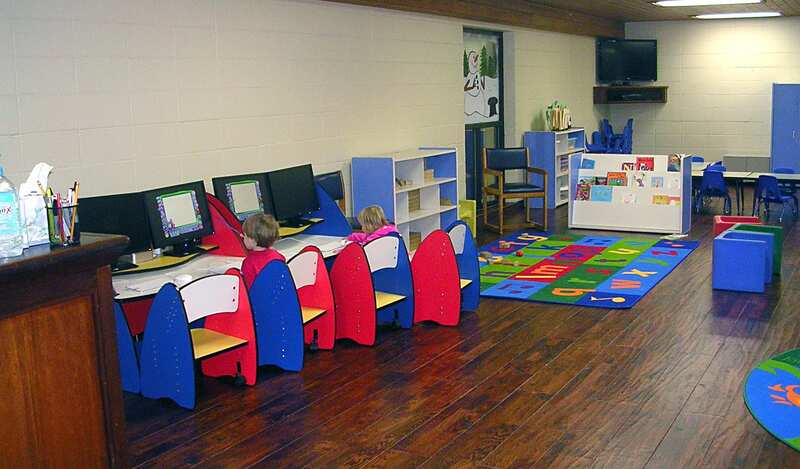 The nursery is also equipped with a 4 station computer lab and a Wii. The children love the educational games and look forward to visiting regularly. 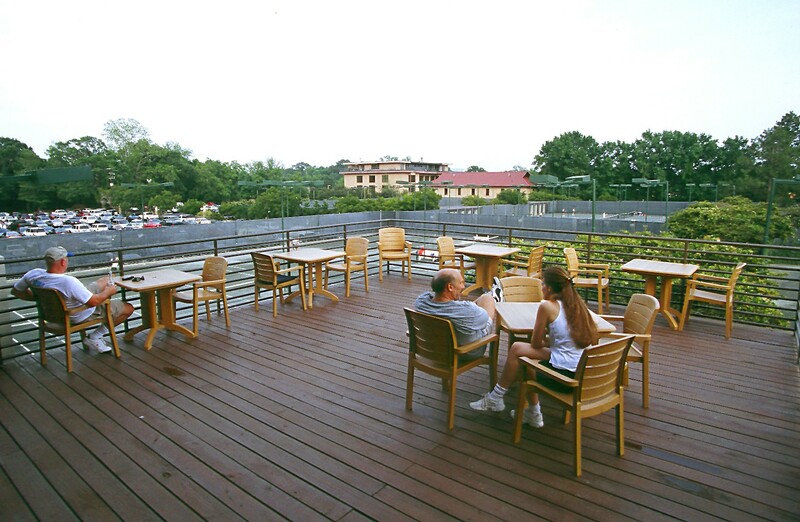 We would like to invite you to join her regular crowd for a drink,or a good cup of Community Coffee, while watching a tennis match from the scenic balcony or simply enjoying the view and the company.